As a result of mining activities, families and entire communities have been deprived of their right to produce and access food. Apart from a few improvements, the situation remains unchanged since 2012. Tete communities have been prevented from producing due to relocation to infertile land by multinational companies. They have also encountered difficulties in getting jobs offered by the companies due to the lack of education opportunities in the region. Medium or high income jobs are given to educated young people from the rest of the country and expatriates whilst low-income jobs go to the locals. The lack of economic means has highly affected their access to food. Farmers used to produce their food and sell the surplus to nearby markets to buy other commodities. Now they depend on exported food from Brazil or South Africa for their survival. Families now pay with difficulties what they used to produce and sell; dependence at its maximum. Every human being wants to feed and support their family. What would you say if you could not? Those who revolted and expressed their dissatisfaction with the process through demonstrations were beaten and silenced by authorities. 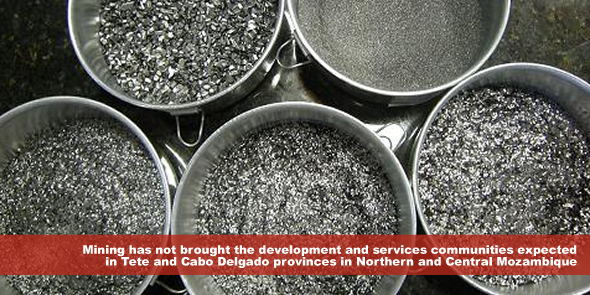 One might say that extraction equals development and that Mozambique benefited from extractive industries. This is partly true. The question is: who benefits? Currently in Mozambique and in many parts of Africa, rural communities are paying the price of urban development that gives opportunities only to a few. Can we really justify the benefits to some by the deprivation of entire populations? In this lies the question: which development do we want for Africa-one that deprives or one that offers opportunities for all? Fundamental to the resolution of such a situation is capacity-building at the local and national level and the creation of alternative ways of development at the grassroots level. Governments should be in a position to negotiate contracts and take into account the welfare of their populations. Young leaders, lawyers and civil society groups also have a role to play in advocating for the rights of communities when faced with the demands of transnational corporations. Our responsibility as individuals is to demand change in perspectives, not to accept any development at all costs. It is not because it looks good that it is good. Communities in Mozambique and elsewhere are not seduced any more by empty promises. Nastasia Thebaud-Bouillon is currently pursuing her LLM in Human Rights and Democratisation in Africa at the Centre for Human Rights (Pretoria, South Africa). She grew up in France and has also lived in Kenya and Canada. Her areas of research and interest include socio-economic rights, food security, women’s rights, the right to development and business and human rights. The extractive industry is dominated by mega multinationals. These fellows do not care about social responsibilities,nor socioeconomic rights of the host communities. They’re capitalist driven,devoid of moral rectitude. Their nuisance level is monumental ridden with abuses and recklessness. The exploitation of natural resources has never been sustainable,eventhough avaricious.